The Who Am I? Series stresses the dignity of each individual as a person made in the image of God. The material in each lesson revolves around fundamentals of our Faith stated in terms young children can understand and remember. Activity worksheets can be used after the lesson to aid the child’s retention of the story and to help the child relate the theme to his daily life. 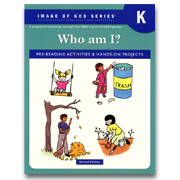 The Kindergarten Teacher's Manual includes lesson explanations, Bible stories retold for children, craft ideas, review questions, action rhymes, reproducible patterns for the suggested crafts, and lesson review worksheets. 29 lessons, including 9 seasonal lessons (All Saints' Day, Thanksgiving, Advent/Christmas, Lent, and Easter). 9"x12", coil bound, 285 pgs. The Kindergarten Workbook includes 83 tear-out, full-color worksheets that correspond to the lessons in the Teacher's Manual. On the back of each workbook sheet is a summarized outline of the lesson including suggested activities.